This is my seventh VeganMoFo post for 2014, and is part of Chef Jason Wyrick’s Vegan Tacos blog tour. I love it when a cookbook practically oozes excitement, expertise and enthusiasm for its subject, and Vegan Tacos by Chef Jason Wyrick does just that. His passion for this classic staple of Mexican street food is infectious, and VT is beautifully executed with snippets of taco history, ingredients and techniques nestled between tons of carefully researched and creative taco recipes. I love tacos, but trying to order vegan tacos in a restaurant can be hit or miss. Sometimes the beans are soaked in lard or pork and sometimes there is nothing notably creative about vegan options offered on the menu. Because of this, I prefer to make my own tacos at home, but it’s easy to get into a taco rut. This is why Vegan Tacos has already become a well-used part of my cookbook collection even though it’s only been out for less than a month. 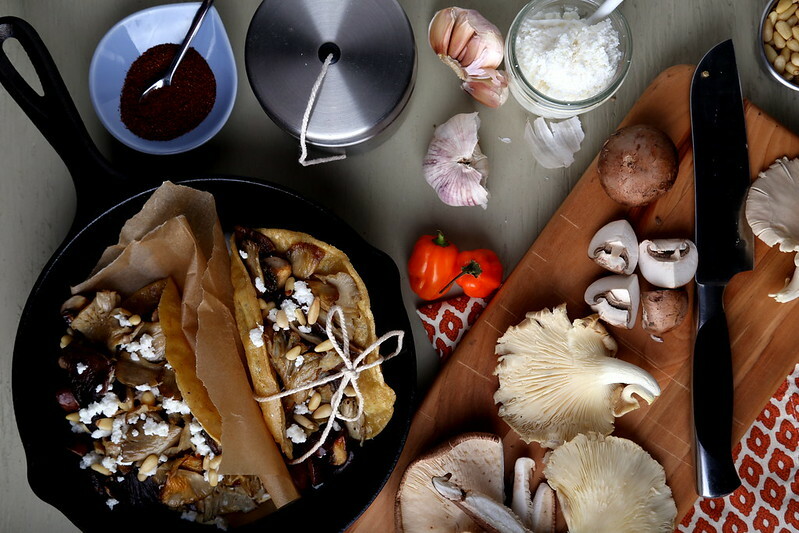 My favorite recipe so far has been Jason’s mushroom tacos (see recipe below). I love how oyster, cremini and shiitake mushrooms are carefully layered to create a richly textured taco that offers an unexpected and complex pop of flavor and smells absolutely amazing once assembled. I also love that these are so simple to throw together in just a few steps. Hungry for more? Want a chance to win your own copy of this taco-ey tome? Lucky for you, the kind folks over at Vegan Heritage Press have kindly offered to give away one free copy of Vegan Tacos through this post! To enter, just leave in the comments section below your favorite taco filling. If you’d like, also share this post on facebook, pinterest, twitter or instagram and tell me you did in a separate comment for a bonus chance to win! I’ll randomly draw a winner on September 25. Shipping is limited to US only, and please leave your email or some way to contact you in case your comment is drawn as the winner. Good luck! Congrats to Amey, winner of this giveaway … thanks to all who entered! 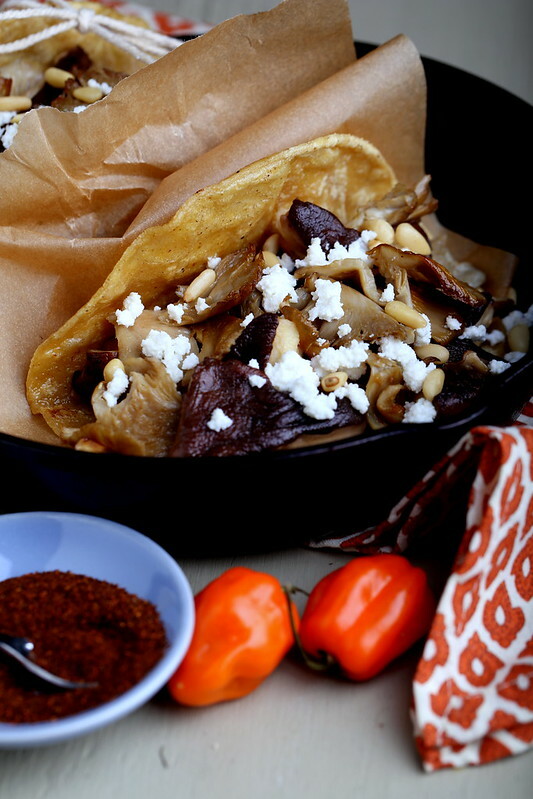 The mixed mushrooms are the stars of this taco, so I leave them fairly unadorned so their flavors can shine. 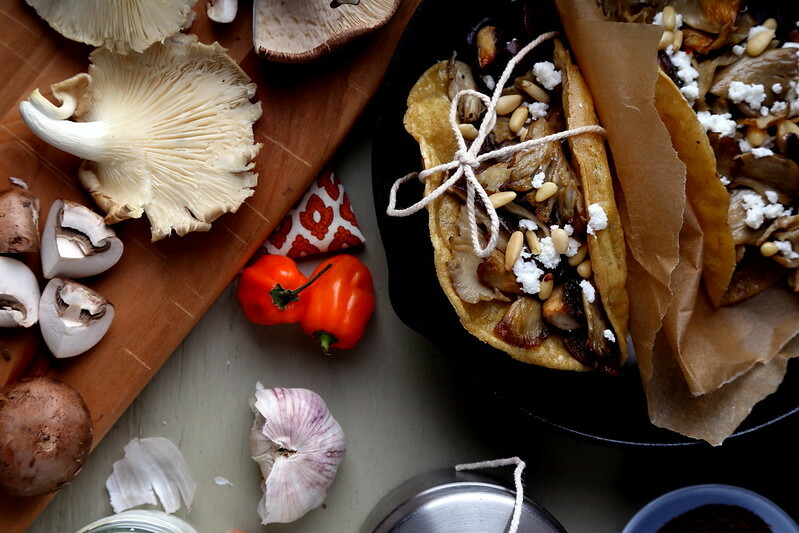 Oyster mushrooms give the taco a heavily browned flavor; the shiitakes add earthiness; and the creminis a sort of mellowness, all working together to provide a complex flavor in every bite. The taco is topped off with roasted habanero sour cream for a piquant bite. For less bite, omit the habanero. These tacos can be a little light, so I sometimes add a cup of cooked black beans at the end of the recipe to make the filling heartier. Heat a dry skillet over a medium heat. Add the guajillo and toast it for 30 seconds on each side. Use a spatula to press it flat on the skillet to maximize the area that gets toasted. Remove the stem. Grind it into powder and set aside. Heat the oil in a large skillet over high heat. 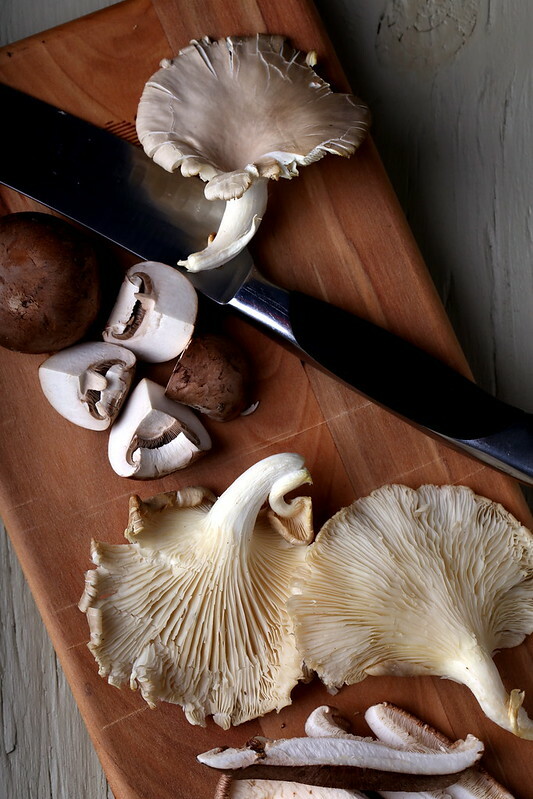 Stir in the oyster mushrooms only, then let them cook for 1 to 2 minutes until they begin to brown. Stir again, and let them sit again. Continue to do this until they are greatly reduced in size and heavily browned and crispy. This will take 10 to 12 minutes. Turn the heat down to medium. Add the shiitakes and cremini mushrooms. Sauté until soft. Add the garlic, epazote, if using, reserved guajillo powder, and salt and sauté another 2 minutes. Remove the pan from the heat. In a blender or food processor puree the roasted habanero, if using, with the sour cream and transfer to a bowl. Warm the tortillas. Fill each taco with the mushrooms, then top with the sour cream or cashew cream, and finish them off with a sprinkle of pine nuts. Beautiful photos! I love black beans, mushrooms, onions, daiya cheddar, a bit of salsa, and some homemade guac on my tacos. Black beans & guacamole are my favorite taco filling… but I definitely need to get out of my taco rut 🙂 thanks for offering the giveaway! My favorite taco fillings are definitely heavily spiced beans and mushrooms. This looks fantastic, as usual. I always look forward to your beautiful posts. And I cannot WAIT to get my hands on that book! Taco Tuesdays are practiced religiously in our home. We don't eat processed food much at all, but an Earth Fare recently opened in our city, so I procured some Beyond Meat Feisty Crumbles to try. Man, were they good. My guys were thrilled. We did double decker style, soft flour tortilla slathered in refried beans, cradling a crunchy corn shell filled with the not-too-spicy crumbles, topped with some freshly shredded cold iceberg, a little Daiya, a little tofutti sour cream, and some Valentina hot sauce. Delicious! I shared this on Pinterest on my vegan treats board too. My favorite taco filling is lentils. I've shard this on Pinterest on my mexican board, and the Vegan community board. Oh wow this looks amazing! Thanks for the recipe! Mushrooms are my favorite food so mushroom tacos are my fave tacos! I love crispy potatoes as a filling. Yum. I love refried pinto means, daiya shredded cheese, vegan sour cream and guacomole. The basics. I AM SALIVATING AT THESE PICTURES SO BADLY. Lucky thing I bought a pack of mushrooms at the store today. The universe, it knew. My favorite taco filling….does an almond butter and banana taco count? If it must be savory, then I loke a lil' TVP simmered in medium heat salsa with a big glob of spicy black bean dip and nutrtional yeast. MMMF. For easy tacos I like to use Beyond Meat Feisty crumbles with Daiya Pepperjack cheese and all the regular additions. Hi I love beans, sautéed peppers and onions, pico de gallo, gauc or fresh avocado, daiya cheddar or pepper jack, blk olives and tons of fresh shredded romaine. I have also recently tried the feisty flavor of beyond meat which is amazing. Roasted chickpea tacos! I drain & rinse a can of chickpeas, roll 'em in taco seasoning, and bake until crispy. Shredded BBQ seitan, guacamole, and melted daiya cheese! These look amazing! I wish I had that taco book, because like you said, sometimes it is easy to get into a taco rut. I just recently baked tofu with tomatillos and made the yummiest taco filling. It is great because the tomatillos get caramelized. Simply amazing. My favorite taco filling is mushroom with homemade refried beans, pico de gallo and guacamole. This book looks amazing?!!! Grilled portobello Mushrooms, bell peppers, onions, avocado, lettuce, salsa, and cashew sour cream! I shared this on twitter and I liked it on Facebook ? Seitan, mushrooms, corn, and lime juice! Isa-inspired. oh man! I am entering every giveaway I can find online for this book – it sounds so amazing. My favorite taco filling is always something pretty simple – like beans and zucchini or something like that. I like it when there are just a couple of dominant flavors and some spices to compliment them. I love lentils in my tacos! I simply adore mushrooms! I will have to try this recipe! Good Luck to All! I love nopales, onion, potato and green peppers on corn tortillas.. nom nom! Some kind of mashed beans, but the rest is variable. Oh yum! This recipe looks divine. My favorite is newly discovered Rancho Gordo heirloom beans cooked in a crock for a day, then dolloped on tortillas with cabbage and raw onion and a dash of hot sauce and Vegan sour cream. Great, now I'm hungry! My tacos MUST have guac!!!! Avocados, soy chorizo, roasted peppers and onions. my favorite has been anaheim peppers, squash blossom, and Epazote However, I have not seen this book, and hoping it will broaden my horizons. guacamole and salsa with a little kick. avocado, vegan chorizo, cashew cream, kiwi salsa! My favorite taco filling is the tempeh taco recipe from Vegan Vittles. My favorite taco filling is quinoa and tempeh chorizo topped with lettuce and a lovely guacamole. My favorite taco fillings are refried pintos, a fresh salsa made with perfectly ripe home grown tomatoes, and guacamole. Lettuce, soy chorizo, guacamole, and salsa! Basil/lime baked tofu, broccoli slaw, and avocado! Roasted sweet potatoes and poblano peppers make a seriously tasty taco! Thanks for the giveaway. I love an imitation ground beef mixed with refried beans…. ummmm making me hungry with all these pictures and comments. Refried beans made with pink beans, onions, guacamole and hot sauce. Mmmmm. Hopefully my entry isn't too late! My favourite taco filling is TVP (reconstituted in vegan 'beef' broth) sauteed with onions, mushrooms and a smokey, spicy homemade taco seasoning. I then partially fill hard-shell tacos with this mixture and add chopped tomatoes, chopped avocado, lettuce (or baby spinach), chopped coriander and homemade sour cream. Occasionally I'll also add a little cheese below the 'mince' layer so it melts. I know it's not authentic but what can you expect from an Australian? 🙂 I know you can't ship overseas so if I win I'd have it shipped to a friend in the US.